Final Cut Pro X (FCPX) offers features such as Magnetic Timeline, Content Auto-Analysis and background rendering. It is a trackless 64-bit application with Grand Central Dispatch and OpenCL support, allowing it to scale and use all available cores for processing such as rendering and transcoding. FCP X supports up to 5K resolutions. It can also prepare footage for quick, automatic fixes of defects such as camera shake, rolling shutter and color balance. Audio can also be analysed to automatically remove hums, pops or other noticeable defects and to assign channel configurations. Learn how to ingest footage and edit, add transitions, titles and effects. Learn how to Synchronise Multi cam footage and edit sound . Finally learn about and outputting your finished project to various media. 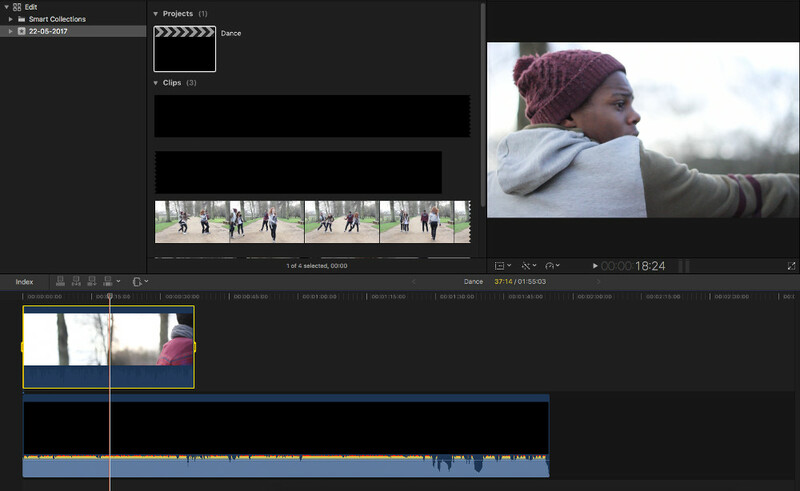 Magnetic Timeline: Edits footage in a storyline without knocking any other clips or audio out of place at other points of the Timeline. Clips now automatically slide in place of gaps. Clips are also now connected to each other; when one clip is moved, the other clip(s) move in sync with it. Multi cam: The multi cam tool, available from version 10.0.3, supports up to 64 angles of photos and videos. It also automatically aligns footage based on time of day, timecode, markers, or audio waveforms, individually or in various customisable combinations. Compound Clips: A new feature to FCP X that allows multiple video and audio clips to be combined into one for simplicity. Merged Clips: This process takes multiple video and audio clips and creates a new Compound Clip containing them all. It synchronises them by comparing audio so that audio recorded on one device and video (also containing audio) recorded on another device can be merged. This is especially useful for those producing with DSLR video cameras. Database Engine: Apple’s own Core Data database engine has been incorporated into FCP X, handling media and metadata management, helping to organise clips quickly with more extensive and customisable metadata abilities than previously. Subjects covered will include, Digitising Footage, Editing, Transitions, Sound Mixing , Compression, Digital Effects. £129 Discount for NUS Students and people on following means tested benefits, proof required: ESA (income related); Income Support; Working Tax Credit (not child tax credit); Council Tax Benefit (not student/single person/reduction due to disability); Housing Benefit; Pension Credit (guarantee); Unwaged Dependent of these benefits. Nick – I just wanted to say a big thank you for the FCPX course last weekend. I gleaned so much information from the course and got all I needed regarding file management, syncing sound and multicam work. L.O. – An interactive class, loved it.